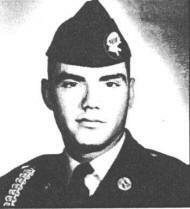 Gary Schwellenbach-Barnard joined the Army in August 1966. He completed airborne training and medics school and was shipped to Vietnam in September 1967. On Dec. 27, Schwellenbach-Barnard made a helicopter assault with his unit, the 173rd Airborne, near the coastal town of Tuy Hoa, 250 miles north of Saigon. The troops jumped off the choppers into an enemy-held landing zone where the Viet Cong were dug in and waiting. In the barrage of heavy sniper and automatic weapons fire, Schwellenbach-Barnard was immediately wounded. But, according to an account accompanying a medal citation, “with complete disregard for his own safety he moved into the most intense area of fire” and brought fallen comrades to safety. He was wounded a second time, refuse aid, and continued to help wounded men. Schwellenbach-Barnard received his third and fatal wound while he was trying to save the life of another man. Gary Schwellenbach-Barnard lived in Chico all his life and loved fishing and motorcycling.